What if the Wolf Snarls? Emerging economies all have risks. But what about virtually unknown Mongolia, where GDP is set to grow at 30 percent a year by 2013? In this article we take a look at the issues facing the country as it strives to cope with its new-found wealth. Extracting Mongolia’s assets requires massive government reform if the country is not to become another Nigeria. What needs to be done and how is this being implemented? The world’s newest mineral-rich investment hotspot has surprises up its sleeves. The average Mongolian is set to become a U.S. dollar billionaire by 2014. In this article we look at the country’s upcoming financial and regulatory reforms and the implications for Mongolians and foreign investors. Moody's Investors Service has changed the outlook on Mongolia’s government bond from stable to negative. At the same time, Moody’s affirmed government’s issuer and bond B1 ratings, unsecured MNT rating at (P)B1 and the issuer’s short-term Not Prime issuer rating. The Government of Mongolia has issued new Resolutions Nos. 88 and 89 on the definition and calculation of mineral royalties. Joint Stock Companies in Mongolia may be created in the form of an “Open” JSC or a “Closed” JSC. An Open JSC is a legal entity where shareholders’ invested capital is divided into shares and registered at the Mongolian Stock Exchange. Shares are traded by the public without regard to preemptive rights of shareholders. Mongolia has a substantial legal framework regulating local and foreign activities established in the country. The most important regulating vehicles are the Company Law, the Civil Code and the Law on Strategic Foreign Investment. 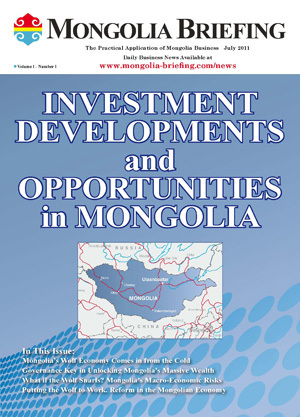 We welcome new and existing readers to our new Mongolia Briefing web site. Founded on the back of increased interest in the economic and business development of the country, we aim this site to be a major source of updated Mongolian commercial news, foreign investment and legal, regulatory, tax and financial updates about this exciting new emerging Asian economy. © 2011-2012 Asia Briefing Ltd. All Rights Reserved.